INS/BCIS (or whatever the current avatar of the organisation) more than personal choice has more or less been dictating my travel schedule in my life. Summer of 2004 was no exception. We (me and my wife) somehow managed to get into one of the weirdest immigration tangle where I had to travel overseas while my wife had to stay put in the United States. The result - a lightening trip to Vancouver for me and an extended vacation to the twin national parks of Wyoming, which in the end turned out to be an excellent choice as it is one of the best of the beaten path in the US. We decided to make Salt Lake City as our base as we could explore some of the lesser known destinations, first of which happened to be Craters of the Moon National Park. The park was relatively small and could be covered in about half a day. The highlight of the park was definitely the collection of lava tunnels (tubes). Since we did not have a good torch, we could only explore the only naturally lighted one among them - the Indian Tunnel. We decided to spend the rest of the day driving on couple of the many famous scenic Idaho byways: Route 75 and Route 93 to Idaho Falls, where we spent the night. The drive was pretty but not outstanding. The next day onwards, our trip started resembling a revolving door with different people joining and leaving at different times. The first group was Sanjay, Gogo (yes, the same one appearing in the Egypt journals) and Praveen (whom I last met when floating down the Alaskan river). They had been busy driving the Going To The Sun road while we where crawling the lava tubes. We met them at the Madison junction of the Yellowstone National Park. 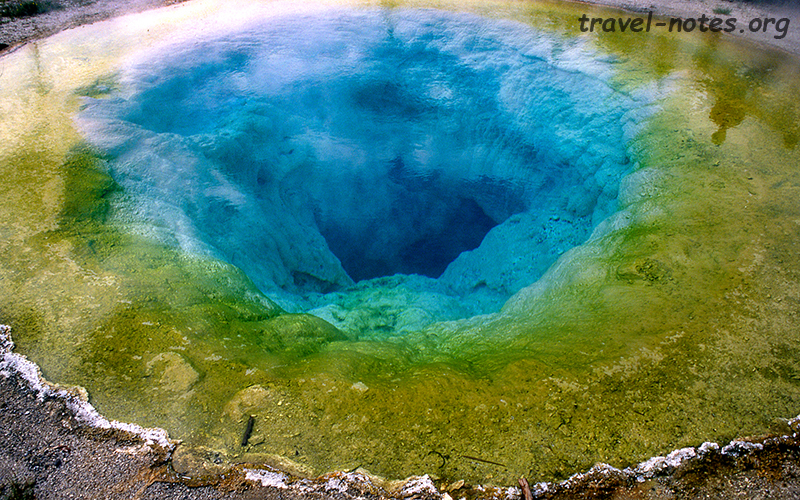 We decided to cover the most sought after part of the park - the geyser basins on the first day. The inconsistent nature of the geysers combined with the inclement weather slowed down our progress for the entire day. We still managed to cover the Upper, Lower, Biscuit and the Old Faithful geyser basins, take a short hike to the Mystic Falls and witness 5 geysers performing in their full glory: Old Faithful, Red Cone, Fountain, Castle and Lion. Although Old Faithful drew bigger crowd (more than some national parks manage to attract in a week!) for each eruption, the Castle and Lion geysers were more spectacular. I was personally more attracted to the pools (Beauty, Chromatic and the Morning Glory are the must sees) and their exotic colourations - all thanks to tiny living bacteria and not to some inanimate mineral deposits. Despite the rain and the cheap $20 K-Mart permeable tents, we managed to spend the night relatively smoothly at the Madison Campground. Gogo and Sanjay had to rush back to satisfy the demands of Corporate America on the following day. After a quick breakfast, we (myself, my wife and Praveen) bid farewell to them and continued on our journey. The agenda for the day was to drive along the famous scenic byways of Wyoming. We did not help ourselves by lingering in the park until the afternoon. We ended up admiring the brilliant terraces of Mammoth Spring basin a little too long and bumping into wildlife a little too often. The result - we had only just enough time to drive back and forth on only one of the byways - the jaw droppingly beautiful Bear Tooth Highway. 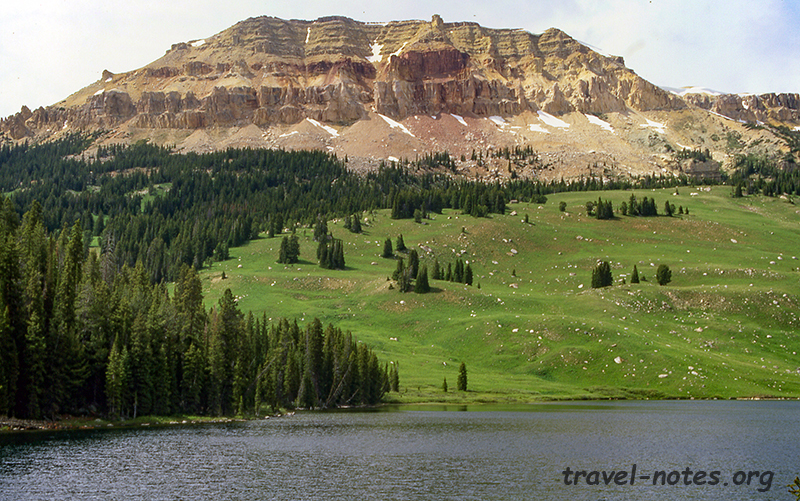 Bear Tooth Highway, part of US 212 between Yellowstone and Red Lodge, meanders through one of the best mountain scenery of the continent. Driving the 68 miles back and forth definitely needs at least half a day in order to soak in the views. The definite must stops are the Pilot and Index overlook, Beartooth Lake and the view points at the Beartooth Pass (10,947ft). Thanks to more wild life stops and to the construction on the eastern Tower to Canyon road, we came back with just enough time to put up the tent and hit the sack at the Canyon camp ground. We got up early the following morning to visit the viewpoints along the Grand Canyon of the Yellowstone. 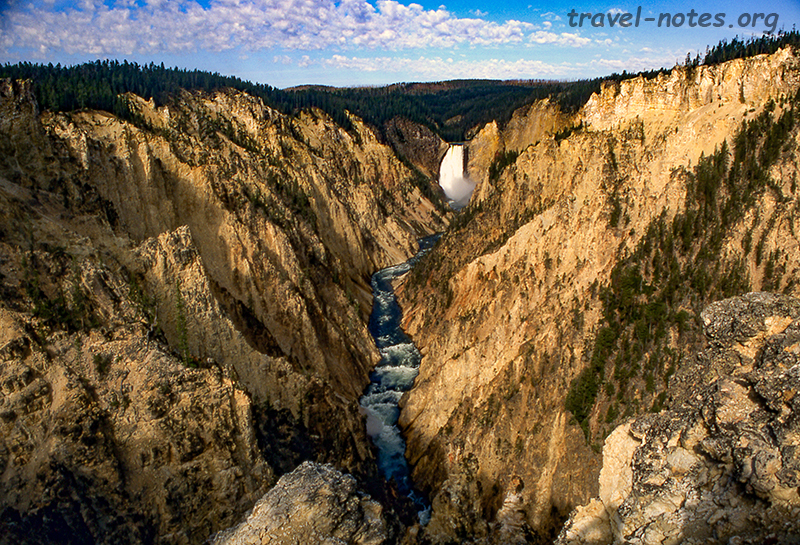 The canyon, cut by the Yellowstone river, is one of the prettiest spots in the park. The steam vents along the canyon walls and the two falls at its beginning only adds to the beauty of the setting. After a good two hours at the canyon, and a quick stop to watch some bubbling springs and lazy buffaloes, we spent rest of the day completing the unfinished work of the previous day. This time however, we had better success. We managed to cover the Shoeshone and Chief Josef scenic byways with enough time to spare. The byways definitely pales in comparison to the Bear Tooth, but the view from the Dead Indian Pass on the Chief Josef justified our effort. According to some sources, the pass is named after the legendary chief of Nez Perce who met his death at the pass. Before the nightfall, we also managed to squeeze in a short 3 hr hike up the Bunsen Peak which gave us a decent view of the northern section of the park. 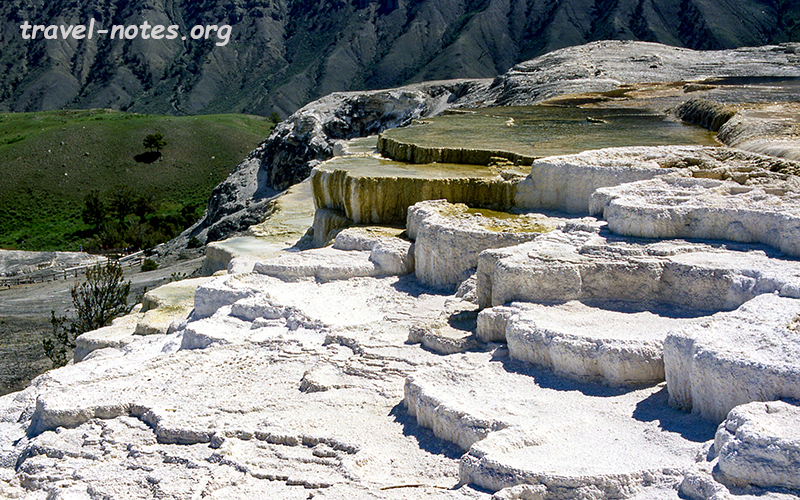 Click here for more photos from Yellowstone National Park. Click here for more photos from Craters of the Moon National Monument. Click here for more photos from Idaho and Wyoming scenic byways.